To be a safe driver, you need space all around your vehicle. When things go wrong, space gives you time to think and to take action. To have space available when something goes wrong, you need to manage space. While this is true for all drivers, it is very important for large vehicles. They take up more space and require more space for stopping and turning. Of all the space around your vehicle, it is the area ahead of the vehicle - the space you are driving into - that is most important. You need space ahead in case you must suddenly stop. According to accident reports, the vehicle that trucks and buses most often run into is the one in front of them. The most frequent cause is following too closely. Remember, if the vehicle ahead of you is smaller than yours, it can probably stop faster than you can. You may crash if you are following too closely. One good rule for how much space you should keep in front of you is at least 1 second for each 10 feet of vehicle length at speeds below 40 mph. At greater speeds, you must add 1 second for safety. For example, if you are driving a 40-foot vehicle, you should leave 4 seconds between you and the vehicle ahead. In a 60-foot rig, you will need 6 seconds. Over 40 mph, you would need 5 seconds for a 40-foot vehicle and 7 seconds for a 60-foot vehicle. To know how much space you have, wait until the vehicle ahead passes a shadow on the road, a pavement marking, or some other clear landmark. Then count off the seconds like this: “one thousand-and-one, one thousand-and-two” and so on, until you reach the same spot. Compare your count with the rule of 1 second for every 10 feet of length. If you are driving a 40 foot truck and only counted up to 2 seconds, you are too close. Drop back a little and count again until you have 4 seconds of following distance (or 5 seconds, if you are going over 40 mph). After a little practice, you will know how far back you should be. Remember to add 1 second for speeds above 40 mph. Also remember that when the road is slippery, you need much more space to stop. What is the most important way to see the sides and rear? What does “communicating” mean in safe driving? What three things add up to stopping distance? Study sections 2.4, 2.5, and 2.6 if you can't answer all of these questions. 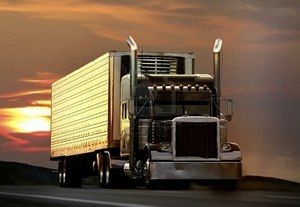 Heavy vehicles are often tailgated when they cannot keep up with the speed of traffic. This often happens when you are going uphill. If a heavy load is slowing you down, stay in the right lane if you can. Going uphill, you should not pass another slow vehicle unless you can get around quickly and safely. When you are traveling slowly. Drivers trapped behind slow vehicles often follow closely. In bad weather. Many car drivers follow large vehicles closely during bad weather, especially when it is hard to see the road ahead. Avoid quick changes. If you have to slow down or turn, signal early and reduce speed very gradually. Increase your following distance. Opening up room in front of you will help you avoid having to make sudden speed or direction changes. It also makes it easier for the tailgater to get around you. Do not speed up. It is safer to be tailgated at a low speed than a high speed. Avoid tricks. Do not turn on your taillights or flash your brake lights. Follow the suggestions above. Commercial vehicles are often wide and take up most of a lane. Safe drivers will manage what little space they have by keeping their vehicle centered in the lane and avoiding driving alongside others. Staying centered in a lane - Keep your vehicle centered in the lane to maintain safe clearance on either side. If your vehicle is wide, you have little room to spare. Strong winds - Strong winds can make it difficult to stay in your lane. The problem is usually worse for lighter vehicles. This problem can be especially bad coming out of tunnels. Do not drive alongside others if you can avoid it. Traveling next to others - There are two dangers in traveling alongside other vehicles. Another driver may change lanes suddenly and turn into you. You may be trapped when you need to change lanes. Find an open spot where you are not near other traffic. When traffic is heavy, it may be hard to find an open spot. If you must travel near other vehicles, try to keep as much space as possible between you and them. Also, drop back or pull forward so you are sure the other driver can see you. Maintain at least 1 second for each 10 feet of vehicle length at speeds below 40 mph. For speeds above 40mph add 1 additional second. While you don't need to memorize the below list word for word, you should understand the overall concepts. A question about how to handle tailgaters may come up on the written exam. To know how much space you have, wait until the vehicle ahead passes a shadow on the road, a pavement marking, or some other clear landmark. Then count off the seconds like this: "one thousand-and-one, one thousand-and-two" and so on, until you reach the same spot. Compare your count with the rule of 1 second for every 10 feet of length. If you are driving a 40-foot truck and only counted up to 2 seconds, you are too close. Drop back a little and count again until you have 4 seconds of following distance (or 5 seconds, if you are going over 40 mph). After a little practice, you will know how far back you should be. Remember to add 1 second for speeds above 40 mph. Also remember that when the road is slippery, you need much more space to stop. Make sure you memorize the following distance formula of 1 second of following distance for every 10ft of vehicle length (adding 1 second for speeds exceeding 40mph). How much space should you keep in front of you while driving? Knowing how to calculate proper following distance is very important and will likely show up on your written exam. Please go over this section thoroughly in your CDL manual and be sure you fully understand how to calculate safe following distance. One good rule for how much space you should keep in front of you is at least 1 second for each 10 feet of vehicle length at speeds below 40 mph. At greater speeds, you must add 1 second for safety. A question regarding safe following distance will very likely show up on your written exam. Be sure to understand the safe driving distance formula. What is the most important space around your vehicle? Of all the space around your vehicle, it is the area ahead of the vehicle—the space you are driving into—that is most important. You need space ahead in case you must suddenly stop. According to accident reports, the vehicle that trucks and buses most often run into is the one in front of them. The most frequent cause is following too closely. Remember, if the vehicle ahead of you is smaller than yours, it can probably stop faster than you can. You may crash if you are following too closely. If you are being tailgated, do the following to reduce the chances of an accident: Avoid quick changes. If you have to slow down or turn, signal early and reduce speed very gradually. Increase your following distance. Opening up room in front of you will help you avoid having to make sudden speed or direction changes. It also makes it easier for the tailgater to get around you. Do not speed up. It is safer to be tailgated at a low speed than a high speed. Avoid tricks. Do not turn on your taillights or flash your brake lights. Follow the suggestions above. What is the proper following distance for a 40 foot vehicle traveling at 35mph? These types of questions almost always show up during the written exam. Be 100% confident you understand the following distance formula. Remember: For every 10ft of you vehicles length, you need 1 second of following distance. Anything over 40mph, add 1 second to your total. It is very important that you understand this and can calculate proper following distance for any vehicle length and any speed. If you are in a 60-foot vehicle traveling 55mph, what should your following distance be? These types of questions are very common during the written exam and can be a bit confusing as they change the size of the vehicle as well as their speeds. But it's rather simple to calculate: For each 10 feet of vehicle, you need 1 second of following distance. Anything over 40mph, simply add 1 second to your total. Be 100% confident about this formula before taking the written exam as this will probably show up.